No matter even its reins, saddle and stirrup etc are old, the original and Arab and Arabian horses are easily distinguished. Their perfection is not through the physical features but is shown by their action and skill. When the kettledrum of battle is beaten, the Arabian horse displays its skill, play and talent and perfection when it enters the rows of the enemies in battleground. The Kaamil Faqeers do not wear the garb of hypocrisy and show but instead, in their stranger garment, to whatsoever heart they see through their Gaze and Look, they make that heart dead against the Outsiders and the Living with Allah Almighty by subjecting it to Fanaa. 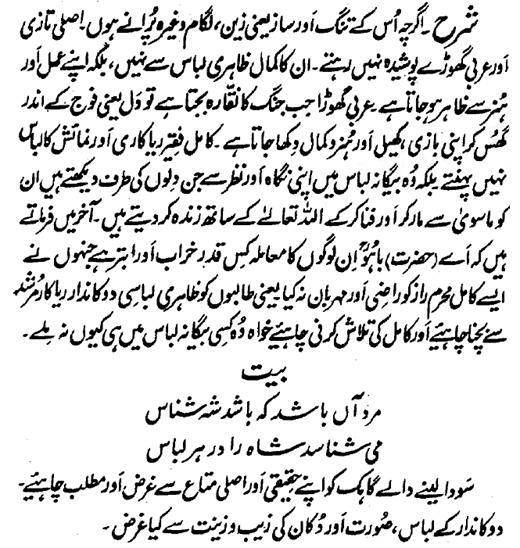 At the end, Hazrat Sultan Bahu Rahmatu-Allahe Ta-aala Alaihe says that 'O Bahu! How ruined and worse is the case of those people, who could not make such Kaamil Privy (and Insider) of Secret glad and pleased upon them! That is, the Seekers should avoid that Murshid who is clad in a formal professional dress and instead they should search for the Kaamil even if he is found in some uncivilized and non-professional raiment.